Charles Nettleton worked for the Victorian police in the 1870s-1880s. 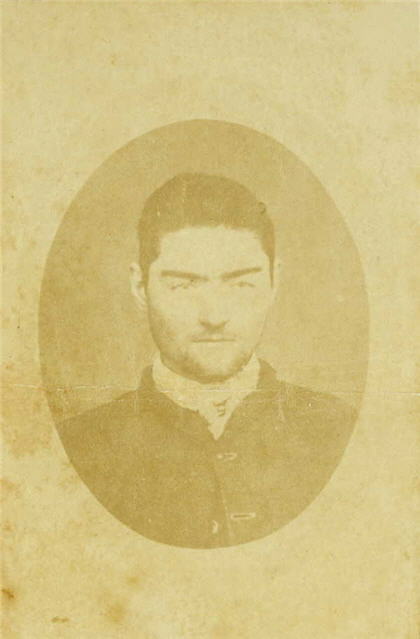 He is believed to be the photographer of this vignette of Ned Kelly dated January 1874 which was attached to Kelly’s Beechworth Gaol Record sheet. Thomas Nevin worked on contract with commission from 1871 to the mid 1880s for the newly instated Colonial Government’s Prisons Department (with the transfer of prisons from Imperial funding) and with the Municipal and Territorial Police in Hobart, Tasmania. His photographic work was considered so effective in police surveillance that he was appointed full-time Office and Hall keeper to the Hobart Town Hall, which housed the Municipal Police Office (with cells), the central registry of criminal records, in January 1876. 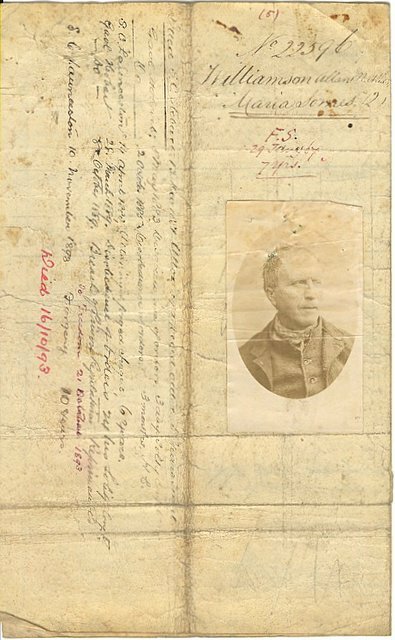 This document, which is an intact parchment criminal record, bears the standard carte-de-visite format used by Nevin and other Australian prison photographers in the 1870s. Allan Williamson was a repeat offender, an habitual criminal with a Supreme Court trial. He was photographed at the Hobart Gaol in 1875 and released with a ticket-of- leave on 12th December 1877, the earlier date being Nevin’s registered photograph. Williamson re-offended, was incarcerated again at the Hobart Gaol and released on several occasions. He died in custody in 1893. Nevin’s busiest years were 1873-1880 at the Municipal Police Office and Hobart Gaol. The transfer of the majority of the criminal class of inmate at the Port Arthur (60 kms from Hobart) to Hobart prisons began in 1871 and was effected by mid-1874. 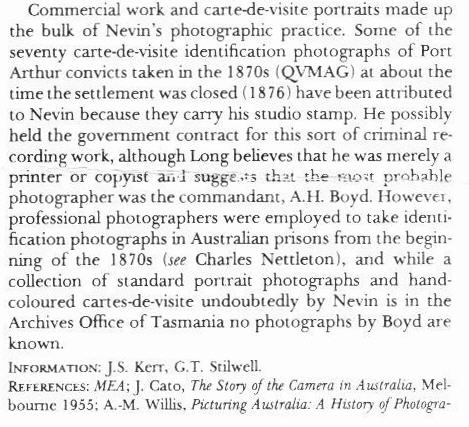 Nevin photographed these men once they had arrived in Hobart, if they had not been photographed earlier at their trial. Few if any were photographed at Port Arthur, and those that were returned, such as William Campbell aka Job Smith, were photographed by Nevin in Hobart prior to departure and in Campbell’s case (later hanged as Job Smith), even escorted back to Port Arthur by Nevin (May 8th 1874). The majority of prisoners whose images survive in public collections today were photographed by Nevin at Supreme Court criminal sittings, and at the adjoining Hobart Gaol, before they were sent down to Port Arthur to serve their sentence, if that was their fate. 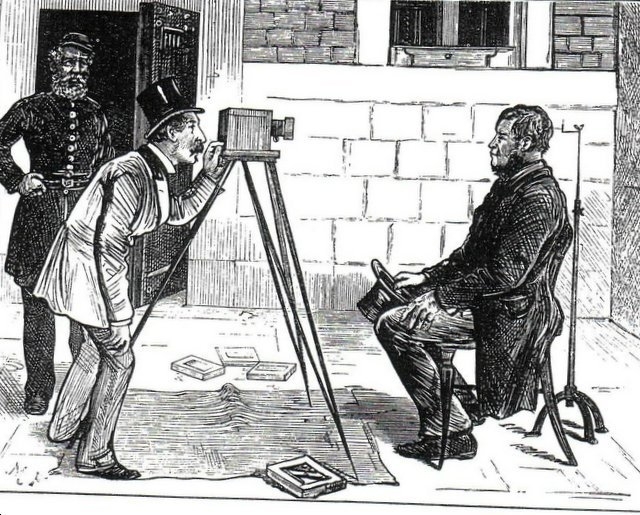 Because of new regulations in force from 1873 following the Victorian commission into Penal Discipline Reforms in 1871 and amendments to the Police Act 1868 requiring the adoption of new police techniques of surveillance and record-keeping in Tasmania, Nevin was required to produce the standard prisoner vignette and duplicates. Those which now survive in public collections at The Mitchell Library NSW (11), the National Library of Australia (84), the Tasmanian Museum and Art Gallery (55), the Archives Office of Tasmania (92) and the Queen Victoria Museum and Art Gallery (112) were all correctly attributed to T.J. Nevin at accession and continue to be correctly attributed to Nevin. Although formerly believed to be some sort of ethnographic portfolio of photographs of transported exiles to Port Arthur (i.e. those who had arrived by 1853 and no later), the men in these images were not photographed because they were transportees per se, nor were they photographed at Port Arthur. Their photographs were reprised by copyists in the 1900s as artefacts of criminality for the middle-class gaze of the tourist to Tasmania whose visits included a tour of Carnarvon, formerly the Port Arthur prison site, but in the 1870s these photographs served the police the immediate and daily purpose of keeping track of habitual criminals for a central registry. These men were photographed on being received in Hobart because of arrest, arraignment, and sentencing at the Supreme Court and Hobart Gaol, and in some cases again when were they were released to freedom with a ticket-of-leave and various other conditions from the Police Office located at the Town Hall where Nevin worked full-time 1876-1880. The weekly police gazettes of the day show a record for every single man in every single extant photograph for these events during these years. The cartes were simply produced to accompany the centrally located police and prisons registers by contracted photographers , and this is the original source from which they were divorced by later copyists. Thomas Nevin was assisted by his younger brother Constable John Nevin who was a salaried employee at the Hobart Gaol during the years 1874 -1884. The contract was issued by W.R. Giblin, variously Attorney-General and Premier, whose portrait Nevin took ca. 1874. The Giblin portrait by Nevin is held at the Archives Office of Tasmania; the Superintendent of Police, Richard Propsting at the Town Hall Office, the Inspector of Police John Swan, and the Sheriff at the Hobart Gaol were Nevin’s supervisors. “‘I have the honor to inform you that in obedience to your instructions I visited the stockade on the 21st and the gaol on the 22nd inst. and likewise consulted the Sheriff and Superintendent of Convicts as to the best method of carrying out the wishes of the Government in regard to taking photographs of the prisoners in these establishments. I found in the stockade 147 and in the gaol 110 prisoners – of these say 120 in the stockade and 70 in the gaol, in all 190, would be such characters as the Sheriff or Commissioner of Police might desire to have photographs of for police purposes. There would be no practical difficulty supposing I had suitable apparatus in taking separate likenesses of the prisoners in either the gaol or stockade, as long as the prisoners did not object to submit to the operation. The best method to be adopted would be to take vignette portraits of them in the open air on the shady side of one of the courts, using a blanket for a background. Such portraits would be little inferior as works of art to those taken in the best lighted studios, and the work might be proceeded rapidly in fine, tolerably calm weather. A dark cell would do for a photographic dark room. As the convicts in the stockade are kept closely shaven and with their hair cut close, the likeness would not be so satisfactory as if taken in their ordinary style of [–]ing the hair, so that I would recommend that future convicts be taken at the gaol after conviction and prior to their being sent to the stockade. This cartoon was reprinted in Davies and Stanbury’s The Mechanical Eye in Australia (1985, page 201). reprinted in The Mechanical Eye in Australia (OUP, Davies & Stanbury, 1985. “possibly by the Commandant A.H. Boyd …” . the ownership of a photograph tent and stand allegedly sent from Port Arthur to Hobart in April 1874 – ownership he concludes was Boyd’s, but examination of the original document (Tasmanian Papers Ref: 320, Mitchell Library SLNSW) cannot support even this claim of ownership, let alone the quantum leap to attributing Boyd as a professional prison photographer where no body of work or reputation ever existed for such a claim, and no official or historical record exists that associates Boyd with either the mandate or the skills to personally take prisoners’ photographs. The Boyd misattribution has wasted the time and effort of a generation of historians with an interest in forensics and police photography. Some of the Victorian mugshots taken in the late 1870s were not vignetted, yet the practice of vignetting, or using an oval frame for the final carte which was pasted to the criminal record continued into the 1880s in NSW. From ca. 1888, the Bertillon mugshot – a square front and profile pair of photographs – replaced this practice in all Australian States. 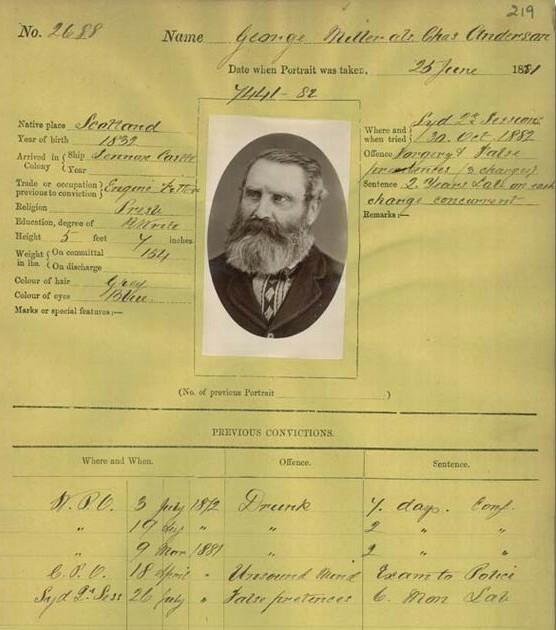 The prison record (below) of George Miller, taken on 25th June, 1881 in a NSW gaol, closely resembles the mid 1870s genre evident in Nevin’s Tasmanian prisoner ID photographs in matters of pose, vignette framing, background and processing. This document abounds with numbers – No.2688 is the prison record number at top left; 219 looks like an archivist’s recent catalogue number; and ??? ?-82 appears above the photo. 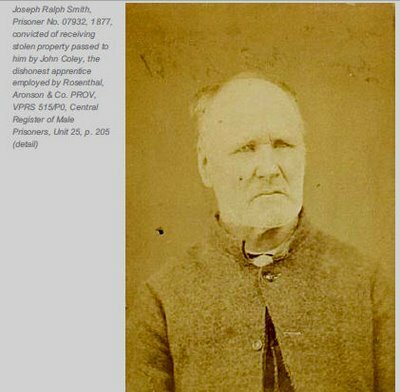 The practice of photographing prisoners in NSW gaols was standard procedure before 1881, given the printed format: above the photo is printed “Date when Portrait was taken … ” and below the photo is printed “No. of previous Portrait …”. The prisoner was convicted as early as July 1872 for drunkenness, but no previous portrait was recorded.